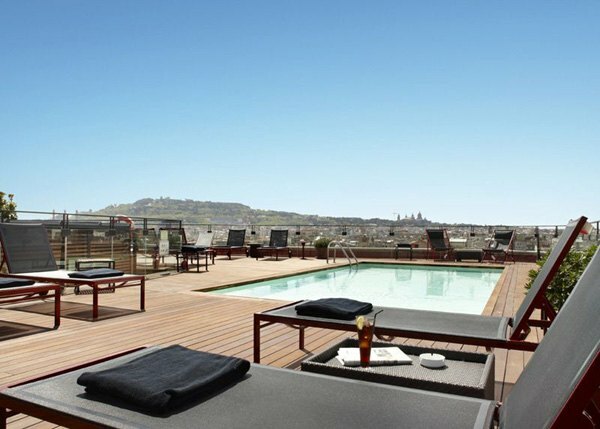 Hotel 1898 is a famous Barcelona hotel located near the La Rambla district. However, you do not even need to be a guest at this hotel to enjoy the rooftop patio. It is an incredible place, where you can enjoy a 360 degree view of the city. They have great couches, an outdoor pool, an outside bar and sumptuous appetizers. This is a great place to go and enjoy the sunset, or spend a night out with friends and family. City Hall is one of the most famous clubs in Barcelona, so if you are looking to party into the early hours of the next morning, it is definitely a place to check out. Besides their club, there is also a wonderful rooftop patio that you can enjoy. The W Hotel has some of the best cocktails in the entire city. Add to that their wonderful rooftop patio at the Eclipse Bar, and it is a perfect combination. The hotel is located right next to the beach, making the view from the roof absolutely gorgeous. They have great happy hour deals, which attract a rather large crowd, especially on Friday afternoons and evenings. The Mirabe is a great place to meet your friends, family or work colleagues. The bar is located at the end of the Avenida Tibidabo, one of the most picturesque parts of the city. The rooftop actually has two floors as well as a garden terrace. They have excellent wine and draft beer selections as well.